by the Australian Bureau of Meteorology. As floodwaters in the Queensland capital Brisbane begin to recede, scientists are casting their eyes out to sea and wondering whether the region's greatest natural feature, the Great Barrier Reef, will be scarred by the experience. This is the world's largest reef system - in fact, the largest thing on Earth made by living organisms, stretching for 2,600km along the coast. Its myriad of islands and tendrils teem with fish, also supporting dugongs, dolphins, turtles and shellfish - and because of all that, a tourist trade worth several billion dollars per year. 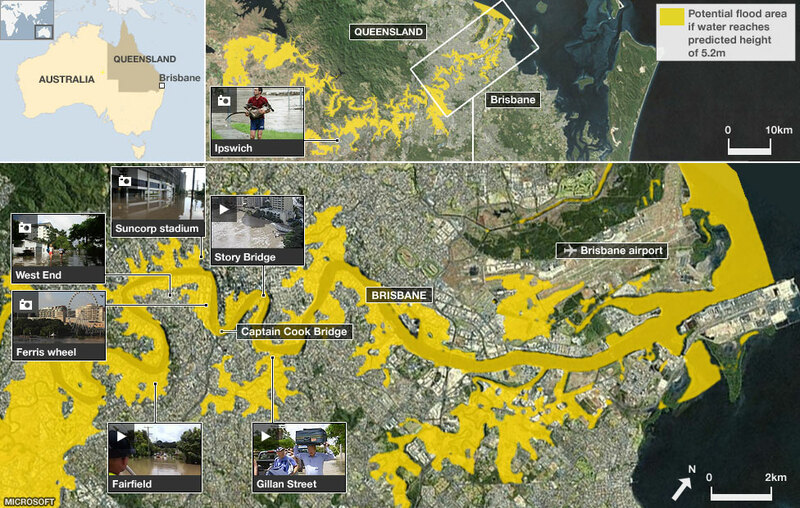 The flood waters emerging from Brisbane itself are not a major concern, as the reef lies further north. But northern rivers are also seeing flow rates way above normal. As the water floods into the seas west of the reef, it inevitably freshens the environment around the reef; which is not good news. "Freshwater kills corals, and there is nothing we can do about it," says Katharina Fabricius, principal research scientist with the Australian Institute of Marine Science. Queensland is a heavily agricultural state. And this means that the floodwater brings with it another threat. Pesticides, herbicides, fertilizers and sediment - mud - are washed off the farms, into the rivers and then onto the reef. The fertilizers do in the sea what they do on land - stimulate the growth of plants. But here, that is a problem, as the marine plants cover growing coral, choking it to death. The sediment also hurts the reef, blocking sunlight and covering the coral fronds. This run-off degrades the reef at the best of times; but in flood conditions, it becomes much more serious. "The young corals are highly sensitive to exposure to organically enriched sediments," Dr Fabricius tells BBC News. "That retards the ability of reefs to recover from the freshwater damage. "My own research has also shown that increasing levels of nutrients can lead to more seaweed - up to a five-fold increase - and reduce coral biodiversity, with half of the coral species potentially lost from the exposed sites." The sites at highest risk are reefs close to the shore and close to the mouths of rivers discharging floodwater. For example, the Keppel group of islands lies about 10km from the shore, in the path of water rushing from the mouth of the Fitzroy River. Scientists monitoring coral there say they have already seen indications of coral damage, but that is is too early to tell how big the impact is likely to be. As the floodwater spreads further from land, it dissipates in the seas - but can still have major consequences. "The waters discharging from the Fitzroy River are moving hundreds of kilometres north and 50-100km offshore," says Michelle Devlin, a coral reef ecologist from James Cook University in Townsville. "There is the potential for large areas of the reef to experience river plume water, with potentially damaging levels of nutrients, sediments and pesticides." On their own, the floods would not necessarily be a significant threat. 1991 saw major damage to inshore coral - but it recovered. "The 1991 flood was extremely hard for the reef - pretty much most of the corals were wiped out down to about six to eight metres of depth, and it took about 10 years for them to recover," says Alison Jones from Central Queensland University in Rockhampton, through which the Fitzroy flows. "But they recovered magnificently; we're very spoiled here in terms of the amount of coral and the speed at which it can grow and recover." However, what concerns scientists most is that this is just one more hit for an ecosystem that is already struggling to cope with many long-term threats. These include overfishing, climate change, disease, chronic pollution and shipping. "The problem is that all forms of disturbances, loads of sediments/nutrients/pesticides, as well as bleaching events from warming seawaters, more intense cyclones and more frequent outbreaks of coral predators such as the crown-of-thorns starfish, all increase in frequency and intensity," says Katharine Fabricius. "This gives the reefs often not enough time to recover before they get hit again." The crown-of-thorns starfish is a good example of how the various threats interact. It eats coral polyps, the organisms that actually build reefs. Overfishing of one of its few predators, the giant triton, allows the starfish population to expand. Meanwhile, in at least one reef system, fertiliser run-off has stimulated the growth of algae, which has provided predators with an alternative food. Reefs stressed by climatic factors, pollution and disease will be less resilient to attack by the voracious starfish. It is likely to be several weeks at least before scientists are able to gauge the true scale of the flood's short-term impacts. The continuing threat of bad weather means that travel to the reef is constrained. And it will be some time - the exact period dependend again on weather - before all of the flood's cargo has travelled through the multifarious fronds of the reef system. The hope is that it will prove to be a one-off hit from which corals, fish and everything else can recover. The long-term threats, though, remain, despite recent initiatives to reduce agricultural run-off, constrain shipping and fishing, and tackle the crown-of-thorns. Climate change is likely to hit reefs in the middle of the tropics harder and faster than the Great Barrier Reef. "Projections of future sea temperatures suggest that coral bleaching could become an annual phenomenon in the course of this century, threatening to undermine the physical and ecological foundations of this diverse and productive ecosystem." 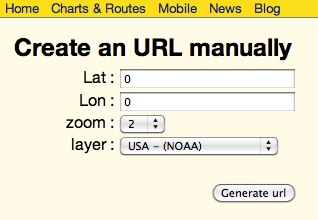 Some webmasters of marine websites asked us how to help them to automatically generate some Marine GeoGarage URL from a list of geographical positions (Lat/Lon). So, this link is a basic user interface allowing to get a direct access to a geographical position in the Marine GeoGarage. Note : Got coordinates in degree-minute-second degrees and need them in decimal format fast ? Zoom : maps on Google Maps have an integer "zoom level" which defines the resolution of the current view. Zoom levels between 0 (the lowest zoom level, in which the entire world can be seen on one map) to 21+ (down to individual buildings) are possible within the default roadmap maps view. Google Maps sets zoom level 0 to encompass the entire earth. Each succeeding zoom level doubles the precision in both horizontal and vertical dimensions. Note: not all zoom levels appear at all locations on the earth. Zoom levels vary depending on location, as data in some parts of the globe is more granular than in other locations. In the high speed world, water becomes thick, dense - an alien environment that we struggle to get through. Over time a strong swimmer can manage about 2 miles an hour. But that’s nothing compared to other mammals like the dolphin, that can reach speeds 5 times faster. But it's only in slow motion that we can see why the dolphin is so much at home here, and why we aren't. Water is 800 times thicker than air - so thick that it pulls and distorts our soft bodies as we swim, causing drag which holds us back. The water doesn't distort the dolphin's body at all, passing smoothly over it. The dolphin has much thicker skin, like rubber, that stops his blubber from flapping. So while we struggle to make headway, the dolphin is barely trying, and when they need to go faster, they can make it look effortless. Using state-of-the-art technologies, Richard Hammond goes beyond the limits of the naked eye and explores the hidden secrets of the invisible world around us. Human vision is pretty miraculous, but our eyes aren’t quite as powerful as you might imagine. What we can see is stuff that reflects or emits light with wavelengths in a very narrow band (since you ask, from about 750 to 400 nanometres). What we can’t see is the rest. That’s all matter that reflects or emits light over the other 99.99% percent of the spectrum. In fact, we’re almost blind. We got a couple of emails from users that would like to report incorrect information regarding Google Maps info. Perhaps a misspelled marina name, incorrect building name in some harbor, etc. Fortunately, Google makes it very easy to report problems like that. You can read all of your options on this help page, but in most cases you'll simply want to use the "Report a Problem" link in Google Maps. The item will usually be corrected in Google Maps within a month, and then corrected in Google Earth at some point after that. Note : that is for Google Maps. Regarding nautical charts and Marine GeoGarage overlays, don't hesitate to contact us directly and we will redirect the info to the Hydrographic Service concerned by the issue. Two and a half minutes on one breath. freedives on one breath to 20 metres to catch a fish. With sea levels rising, can humans adapt to a more watery world? The Bajau people of South-East Asia live in stilt houses and fish underwater for up to five minutes on one breath. What does this do to the body? Take a deep breath in - how long until the urge to gasp for air becomes too much? Perhaps it comes after 30 or 40 seconds. But the bodies of habitual freedivers, who hold their breath for minutes at a time, can change to be better adapted to the water. The Bajau people, sometimes known as the sea gypsies of Malaysia and Indonesia, are renowned natural freedivers. Traditionally, they are born, live and die at sea, and fish by diving 20m (more than 65ft) underwater for minutes at a time on one breath. At this depth, water pressure is almost three times what it is on the surface, squeezing lungs already deprived of oxygen. Filmed underwater in real time for the BBC's Human Planet (see exclusive series trailer), Bajau fisherman Sulbin demonstrates his techniques off the east coast of Sabah, Borneo. Wearing hand-made wooden goggles and armed with a spear, he first prepares himself mentally. "I focus my mind on breathing. I only dive once I'm totally relaxed," says Sulbin, who goes into a trance-like state before entering the water. This degree of mind control is crucial, says freediving instructor Emma Farrell, the author of One Breath, A Reflection on Freediving. "You have to be warm and relaxed - you don't want to hyperventilate before taking your last breath." The mammalian dive reflex - seen in aquatic animals such as dolphins and otters, and in humans to a lesser extent - helps, says Farrell. "It's a series of automatic adjustments we make when submerged in cold water. It reduces the heart rate and metabolism to slow the rate you use oxygen." During breath-holding, oxygen stores reduce and the body starts diverting blood from hands and feet to the vital organs. Our bodies have a way to compensate. Underwater pressure constricts the spleen, squeezing out extra haemoglobin, the protein in red corpuscles that carry oxygen around the body. "Not enough research has been done to know if it wears off when you're not diving," says Farrell. "But I know people who do a lot of deep training - as Sulbin does - whose blood is like that of people living at high altitude." In high altitudes, there is less oxygen and so the amount of haemoglobin in blood increases. For most of their history, the Bajau have lived on houseboats, or in stilt houses built on coral reefs - some far from shore. Many report feeling "landsick" on the rare occasions they spend time on dry land. Thanks to time spent in the water as children when the eyes are developing, the Bajau, in common with other coastal dwelling people, have unusually strong underwater vision. Their eye muscles have adapted to constrict the pupils more, and to change the lens shape to increase light refraction. This makes their underwater eyesight twice as strong, according to Anna Gislen, of Sweden's Lund University, who from 2003 has compared the water vision of sea gypsy children of Thailand and Burma with that of European children. A gap that can narrow with training. One part of the Bajau body that hasn't fared well is the eardrum, which ruptures at a young age, says Human Planet director Tom Hugh-Jones. "Sulbin's hearing is shot because he doesn't equalise the pressure in his ears as he dives. He's never had formal dive training. He was taught by his father to hold his breath." There are evolutionary theories - not widely accepted, he adds - that an early ancestor of modern humans had to adapt to a partially aquatic environment. The aquatic ape theory suggests this is why humans are largely hairless and have a subcutaneous layer of fat for underwater insulation, and so are better adapted to swimming than near relations such as the great ape. Bajau children's underwater vision is less blurred than landlubbers of the same age. But Sulbin and other Bajau divers have little body fat. The wiry frame of these subsistence fisherman may actually help. A lean physique is more efficient at using oxygen. And having little body fat makes Sulbin less buoyant, able to walk across the reef bed with ease. "This type of freediving - repeatedly diving to depths of 10 to 20m - carries the greatest risk of decompression sickness," says Farrell. "But you are less likely to get the bends if you are lean, or very well hydrated." Some Bajau die of the bends from diving - also a risk for compression divers in the Philippines encountered by the Human Planet team. "Anyone who thinks this is an example of what a non-smoker's lungs can do will be disappointed," says Hugh-Jones. "Sulbin smokes like a chimney. He says it relaxes his chest." YouTube : Pa-aling divers, one of the most dangerous fishing methods of all. A 100 strong crew in the Philippines dive to 40 metres, breathing air pumped through makeshift tangled tubes by a rusty compressor. Hurricane Bill nears Cuba in 2009. It’s hard to believe that, in this day and age, we don’t have a way to measure sea-level air pressure during hurricanes. 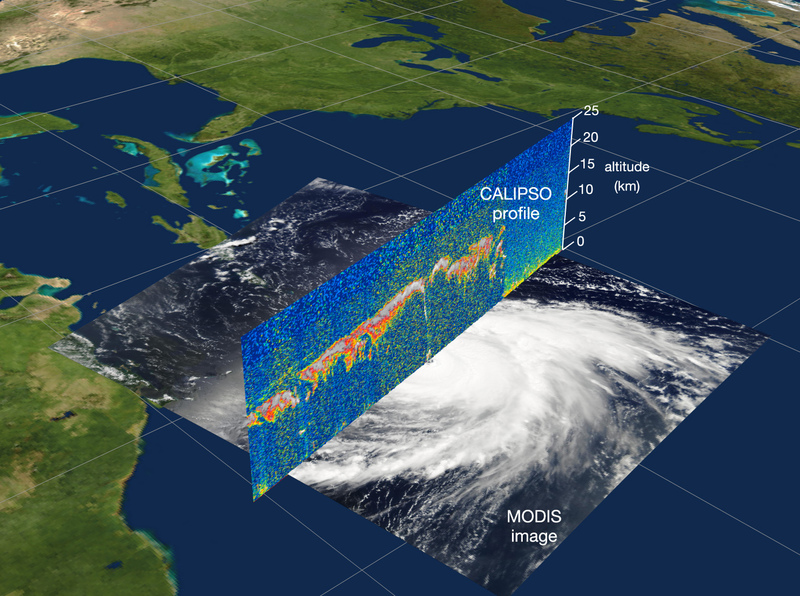 NASA researchers, however, are working on a system that will improve forecasting of severe ocean weather by doing just that. The device measures sea-level air pressure, a critical component of hurricane formation – and one that has been extremely difficult to capture. The Differential Absorption Barometric Radar (DIABAR) prototype is scheduled to make its second flight early this year. DIABAR remotely senses barometric pressure at sea level, which is important in the prediction and forecasting of severe weather, especially hurricanes, over oceans. But the ability to measure sea-level air pressure is a major missing link in storm observation, says Dr. Bing Lin, an atmospheric scientist at NASA Langley Research Center in Hampton, Va.
“Air pressure is a driving force of weather systems, especially under severe weather conditions like hurricanes,” he said. A hurricane begins as a tropical wave, a westward-moving area of low air pressure. As warm, moist air over the ocean rises in the low air-pressure area, surrounding air replaces it, and circulation forms. This produces strong gusty winds, heavy rain and thunderclouds – a tropical disturbance. As air pressure drops and winds sustain at 38 mph or more, the disturbance becomes a tropical depression, then a tropical storm, and finally a hurricane with sustained winds of over 73 mph. Lin hopes eventually to be able to measure sea-level air pressure from aircraft flyovers and space-based satellites. The local coverage provide by flyovers, combined with a broad perspective from space, will provide enough information to significantly improve the ability of forecasters to determine how intense a hurricane is and where it’s headed. “Large and frequent sea surface measurements are critically needed,” he said. An effort to remotely sense barometric pressure at sea-surface level using microwaves was undertaken at NASA’s Jet Propulsion Laboratory in Pasadena, Calif., in the 1980s. “JPL has extensive experience on spaceborne microwave sensors,” said Lin. DIABAR was first deployed on a Navy MH-60S helicopter in 2009 at Naval Air Station Patuxent River in Maryland. “We flew it, got the results, and it looks great,” said Lin. The next step is testing this year on a blimp called the Bullet™ Class 580, the world’s largest airship. E-Green Technologies Inc. in Alabama makes the aircraft. The 235-foot long, 65-foot diameter lighter-than-air vehicle is designed to fly on algae-based biofuel at speeds up to 74 mph and altitudes up to 20,000 feet. It will be stationed in a hanger at Moffett Federal Airfield at NASA Ames Research Center in California. DIABAR is a partnership between NASA Langley, Old Dominion University in Norfolk, Va., and the State University of New York at Albany. Melt off from small mountain glaciers and ice caps will contribute about 12 centimetres to world sea-level increases by 2100, according to UBC research published this week in Nature GeoScience (Regionally differentiated contribution of mountain glaciers and ice caps to future sea-level rise). The largest contributors to projected global sea-level increases are glaciers in Arctic Canada, Alaska and landmass bound glaciers in the Antarctic. Glaciers in the European Alps, New Zealand, the Caucasus, Western Canada and the Western United Sates--though small absolute contributors to global sea-level increases--are projected to lose more than 50 per cent of their current ice volume. The study modelled volume loss and melt off from 120,000 mountain glaciers and ice caps, and is one of the first to provide detailed projections by region. Currently, melt from smaller mountain glaciers and ice caps is responsible for a disproportionally large portion of sea level increases, even though they contain less than one per cent of all water on Earth bound in glacier ice. “There is a lot of focus on the large ice sheets but very few global scale studies quantifying how much melt to expect from these smaller glaciers that make up about 40 percent of the entire sea-level rise that we observe right now,” says Valentina Radic, a postdoctoral researcher with the Department of Earth and Ocean Sciences and lead author of the study. Increases in sea levels caused by the melting of the Greenland and Antarctic ice sheets, and the thermal expansion of water, are excluded from the results. Radic and colleague Regine Hock at the University of Alaska, Fairbanks, modelled future glacier melt based on temperature and precipitation projections from 10 global climate models used by the Intergovernmental Panel on Climate Change (IPCC). “While the overall sea level increase projections in our study are on par with IPCC studies, our results are more detailed and regionally resolved,” says Radic. Global projections of sea level rises from mountain glacier and ice cap melt from the IPCC range between seven and 17 centimetres by the end of 2100. Radic’s projections are only slightly higher, in the range of seven to 18 centimetres. Radic’s projections don’t include glacier calving--the production of icebergs. Calving of tide-water glaciers may account for 30 per cent to 40 per cent of their total mass loss. “Incorporating calving into the models of glacier mass changes on regional and global scale is still a challenge and a major task for future work,” says Radic. However, the new projections include detailed projection of melt off from small glaciers surrounding the Greenland and Antarctic ice sheets, which have so far been excluded from, or only estimated in, global assessments. The magnetic north pole is currently hovering over the North Sea and moving toward Siberia. This means two Florida airports are renumbering their runways. Odd as this connection may appear on the surface, the adjustments under way at Tampa International Airport and beginning next week at Peter O'Knight Airport are the result of a natural, ongoing process. The Earth has an iron core, and movement within its outer part is likely responsible for sustaining a magnetic field, which constitutes much of what we measure at the Earth's surface. As a result, the Earth resembles something of a giant magnet with two poles: magnetic north and magnetic south. However, its field is not perfectly symmetrical and has undulations that are always moving around, according to Jeffrey Love, a research scientist with the U.S. Geological Survey's Geomagnetism Program. The magnetic poles don't line up with the geographic ones, and the difference between them is an angle called declination. As if this wasn't enough of a nuisance for navigators, the Earth's magnetic field drifts, causing the angle of declination to change over time. In fact, it drifts about one-fifth of a degree a year at lower latitudes, such as Florida. "So that means if you wait five years, the compass will be off by one degree," Love said. For long-distance air travel, an error of only a couple of degrees could translate to arriving in the wrong airport, Love said. Declination also varies depending on location. At high latitudes, it tends to become larger, and a compass becomes increasingly unreliable. If you were to stand over a magnetic pole, and tried to use your compass, it would not know where to point, Love said. As the patterns of motion of the molten iron in the Earth's core changes, so does the shape of the magnetic field, he said. Right now, the magnetic north pole, where the field is vertical, is located at 84.97 degrees North and 132.35 degrees West, above the North Sea and drifting generally north-northwest toward Siberia at about 55 kilometers (34.2 miles) per year, according to Love. What's going on in Florida? Travelers have struggled with the complexity of navigating by compass for centuries, and modern American travelers are no exception. Runways are designated according to the points on a compass, and the drifting magnetic north means that they, periodically, need to be renamed. "Recently, the drift has caused our runways' orientations to be closer to the next increment on the magnetic compass," Tampa International Airport spokeswoman Brenda Geoghagan told LiveScience in an e-mail. For example, the west parallel runway, which was named 36Left —18Right to designate compass points of 360 degrees and 180 degrees, is being renamed to 1Left — 19Right, to indicate 10 degrees and 190 degrees, since the runway designations are separated into 10-degree increments. Adjustments to runways like this and to navigational aids are ongoing, according to Kathleen Bergen, a spokeswoman for the Federal Aviation Administration's Southern Region. A third airport is scheduled to rename its runways in October; however, the changes aren't necessary for all airports in the Tampa Bay area, she said. Every five years, federal agencies tabulate and publish a value called magnetic variation, which varies by location. Similar to declination, it correlates true direction to the magnetic compass readings needed for navigation. These values are used to update navigational aids, such as instrument landing systems and beacons, she said. If there is a change of more than three degrees at any given airport, then runways need to be renumbered, as is happening at the Florida airports, Bergen said. While aviation in the United States still relies on ground-based radar, which is calibrated to the local magnetic variation, it is moving toward a satellite-based system. "Runways are still aligned toward magnetic poles. That’s not going to change," she said. The same forces that cause the magnetic poles to drift can also cause a more dramatic change by switching the magnetic north pole to magnetic south pole, and vice versa, Love said. In fact, the physics behind the activity in the Earth's core could just as easily generate a polarity opposite of what exists today, he said. The poles last reversed themselves 780,000 years ago, and the reversals typically take 10,000 years or more to happen. "In terms of what kind of havoc it could wreak or effects on humankind, we can't really say because we haven't experienced it," he said. "I don't think it will be the end of the world." NationalGeographic : Shifts in Earth's magnetic field driven by oceans? PacificNWNationalLaboratory : Magnetic attraction for fish, crabs? 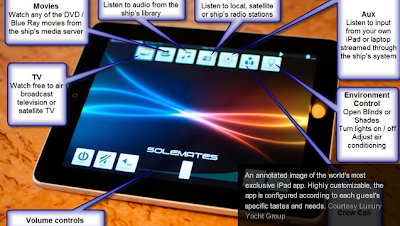 What do you get when you combine the latest superyacht with an Apple iPad? Answer: The world's most exclusive app. Custom-made software from German luxury yacht firm Lurssen gives passengers control of everything but the captain's steering wheel -- all with the most leisurely brush of their iPad. "Solemates," the first pleasure yacht to carry the technology, is currently playing host to flamboyant rap tycoon Sean "P. Diddy" Combs, girlfriend Kim Porter and their daughters D'Lila and Jessie, confirmed the yacht's charter firm. Using complimentary iPads, the millionaire mogul and his family will have control of all the shipboard entertainment and climate systems, the blinds and lights in their cabins, and could even have their Pina Coladas topped-up at the tap of an icon. "You won't find this app for download in the Apple store any time soon," said Rupert Connor, central agent from chartering firm the Luxury Yacht Group. "The captain hands each guest their own iPad when they board, which they get to keep for the entirety of their trip." Connor, whose company is responsible for leasing "Solemates" on behalf of its owner, says that guests are given the option to customize the app's homepage to suit their preferences. "For instance, if we have a client who we know is a music industry bigwig, then we'll program the app's homepage to have a prominent shortcut to our high-speed media server's music library, and we'll do our research to make sure we have all the music they'd want to listen to." At $690,000 a week, plus expenses (which Connor conservatively puts at a further $150,000), the super-rich certainly get more than a glorified remote control when they step on board. Aside from ultra-lux furnishings, a bounty of Jacuzzis and enough flat-screen LCD panels to tile a roof, Connor says "Solemates" also lets guests keep fit in style. "We've a top-of-the-range al-fresco gym on board, but if you prefer keeping in shape on the dance floor then it converts into a disco, with an $80,000 integrated light and sound system," he said. After a round on the inflatable floating trampoline, jet-powered surfboards or James Bond-style underwater "sea bobs," whoever's lucky enough to commandeer the master cabin can wash off in what Connor believes is the world's first yacht-board aromatherapy shower. "This is aromatherapy direct from the shower-head," said Connor. "It comes in four different flavors: eucalyptus, pine needle, citrus, and peppermint." However, beyond the high-tech toys and luxury linens, the gizmo-clad superyacht's greatest asset is its crew, says Connor. "We've an amazingly experienced crew which includes a chef who's worked in some of the best restaurants in Paris and England, a stewardess who speaks five languages and another who is also a cardiothoracic nurse." After blowing just shy of $1 million in a week, let's hope she's on standby when Diddy sees the bill.